One of the lessons of learned from 9-11 is that walking was often the best, fastest, and highest capacity way for large masses of people to escape from a disaster area. While roads, bridges, and mass transit were at a standstill, driven far beyond their carrying capacity, thousands of people walked around the gridlock to safety. Upshot: Authorities need to create and follow pedestrian evacuation plans, especially in high density areas. In many cases, provisions should be made to shut down traffic lanes to motor traffic and converting them for pedestrian evacuation--because oftentimes that is the quickest and most efficient way to move large masses of people. A similar phenomenon is happening after Superstorm Sandy: Thousands of people are finding that walking and biking picks up the slack when other transportation modes fail. And the bicycling and walking infrastructure built to meet the needs of normal times now has a more urgent use. New York, once known as New Amsterdam, could soon look a lot more like...well, Amsterdam. 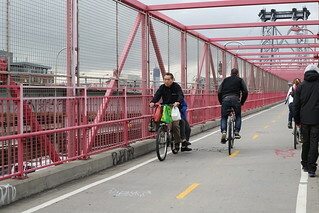 In the midst of congested transit left in Super Storm Sandy’s wake, more New Yorkers are opting to ride bicycles. Drivers who called the Shell station on Atlantic Avenue in Brooklyn’s Cobble Hill neighborhood looking for gas Thursday got a piece of unsolicited advice from the owner. “Bicycles!” the owner, Tony, shouted at callers before hanging up. Many New Yorkers don’t need to be told twice. 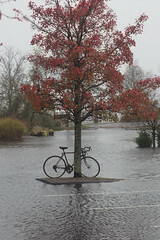 Biking has become an integral part of the post-Sandy commute, but not all of the two-wheeled commuters are avid cyclists. Some people are rediscovering an old pastime. Last week’s post-Sandy subway and commuter rail shutdown sent armies of riders above ground, into cars and buses — creating a real Trafficgeddon. But don’t blame Mother Nature alone. Other culprits: Transportation Commissioner Janette Sadik-Khan, Mayor Bloomberg and an anti-car agenda that’s produced bike lanes, pedestrian plazas, mid-street parking — you name it. Anything to make life a paradise for cyclists and pedestrians. And hell for motorists. We wonder if he believes that post-Sandy. And if the hundreds of thousands of motorists paralyzed for hours last week agree. Er, yeah. Because if traffic gridlock--caused by shutdowns in the transit system forcing millions of people onto the road network--is bad, the best solution is to remove all remaining options and force even more people into cars and onto the gridlocked streets. I’m gonna be a bit behind schedule with the new rant about the transportation commissioner and bike lanes. Hate to waste the great set-up from Jen blaming bikes for getting in the way of buses (so great that Lhota tweeted about that in the middle of the worst disaster that’s ever hit the MTA), but I got stuck waiting for free gas from the National Guard for 20 hours. The line was unbelievable. I ended up sleeping behind the steering wheel. When I woke up, the Excursion was actually out of gas (I had gotten in line with half a tank — gotta be prepared!) because I’d kept the engine running to stay warm. After that, I had to get out and roll the car forward every time the line moved up. So, while I’m rolling the Excursion toward the gas tanker this morning, all these cyclists start whizzing by me, ringing their bells cos I’m standing in a bike lane pushing my car. Crikey. Can you believe the nerve! Some of us have jobs to get to, and these people are only worried about their precious bike lane and their precious children sitting in their precious rear rack-mounted child seats. If I’d had gas in the car I’d have given them all a good scare. The rest of the "letter" here--definitely worth a read! Photo credits: Bicycle Island by eclectic echoes on FlickR. License: Creative Commons, CC BY-NC 2.0. Couple on a bicycle, Williamsburg Bridge, by WarmSleepy on FlickR. License: Creative Commons, CC BY 2.0. « Previous story: Candidates Romney and Obama on transportation issues--what are their positions? 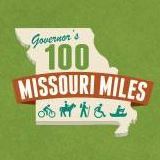 Bike/ped news roundup: Cape Girardeau ped-friendly Broadway in Cape Girardeau, young people driving 23% less, Hurricane Sandy, more . . .